Designed as a big double house with twin town home like spaces, this luxurious art deco city house, built in 1999, is sleek, modern and elegant. 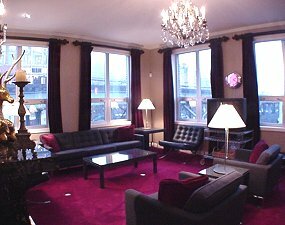 Unique among downtown Chicago lodging accommodations, the guest quarters, a solid, self-contained 3500 square feet with private entrance and 4 bedrooms, each with interior bath, works equally well as a conventional inn, with lodging available by the room, or as a whole house vacation rental home. Wonderfully situated in Chicago's affluent, upscale Near North Side, the Bed and Breakfast is a neat two miles north of the Chicago business district and one mile north of North Michigan Avenue shopping. Just two blocks from the Old Town commercial hub, we are a short walk to many fine neighborhood restaurants and entertainment venues, 4 premier supermarkets, a 24-hour Walgreen's Pharmacy, a stellar 24-hour XSport fitness center and the only 24-hour Starbucks in Chicago. Each of four guest suites has a queen-size bed with superior mattress and private en suite bathroom.... Common areas, shared only by other guests, feature a 45 foot long living room / dining room, a fully equipped chef's kitchen, rooftop gardens, a penthouse sitting area, study, laundry facilities and workout room with lots of storage for bikes, golf clubs, baby buggies or convention exhibits.... Click Here for full details. This and other Chicago Bed and Breakfast Inns can be found here in The Register. 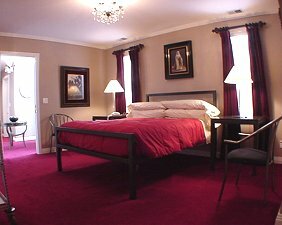 Romantic Country Inns, Getaways and B&Bs offer a great vacation rental alternative to big hotels.